The Cincinnati Bengals won't have many rookies starting this year, but the one that does could be a Day 3 pick. 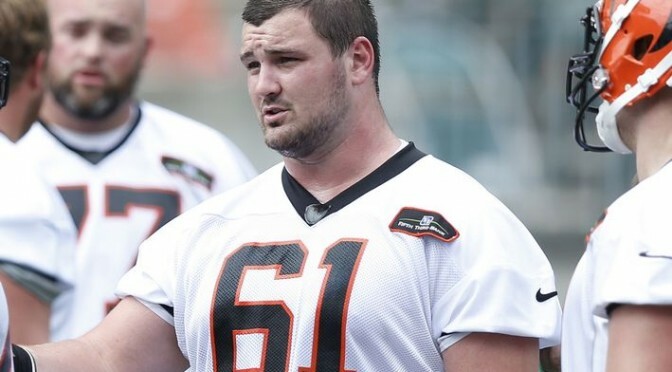 Russell Bodine may have been drafted out of North Carolina in the fourth round, but Bengals coaches have made it no secret they think he can start as a rookie. That belief was only reinforced during OTAs, where Geoff Hobson believes Bodine strengthened his chances to open the regular season as the starting center. It seems like fourth-round pick Russell Bodine is their guy at center and I think they’ll be fine there. Bodine’s got a nice nasty streak and a real serious demeanor. The last week of workouts he struggled with some high shot-gun snaps early in practice and when I asked him about it he looked right through me with an Arctic stare. "It will get worked out,’ he said simply. And it did even during that practice. He worked on it on the side with offensive line coach Paul Alexander and when he got back in the practice, the snaps were fine, which shows you he’s conscientious and coachable. You know you're doing good when you're drawing praise from the guy you're competing for a starting job with. That's the case with Bodine and Mike Pollak, whom the Bengals re-signed this offseason and are giving him a chance to replace Kyle Cook. It also helps that his former Tar Heels teammate, Giovani Bernard, praised the addition of Bodine. But Pollak missed OTAs with a knee injury, and he got to watch Bodine from the sidelines, and he liked what he saw.t's safe to say Bodine is at least going to get significant playing time at center during the preseason. That's when he needs to prove the coaches are right to believe in him and make him the starting center as a rookie.